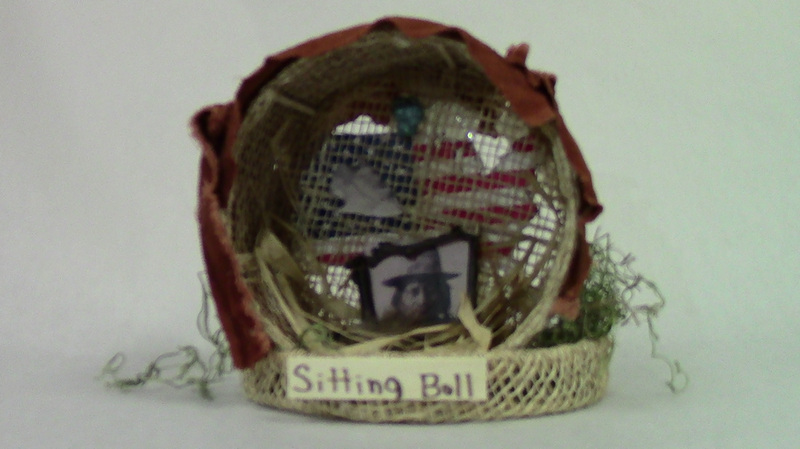 This shadow box represents the life of Sitting Bull. He was witness of the Native American genocide. The shadow box includes natural colors like browns and yellows because that’s the kind of environment that the Native Indians lived in. The American flag in the background resembled where the genocide took place. The hay below the picture of Sitting Bull resembles the Plains of America where he and his tribe secluded themselves from the white settlers. Our nation was born in genocide when it embraced the doctrine that the original American, the Indian, was an inferior race. Even before there were large numbers of Negroes on our shore, the scar of racial hatred had already disfigured colonial society. From the sixteenth century forward, blood flowed in battles over racial supremacy. We are perhaps the only nation which tried as a matter of national policy to wipe out its indigenous population. Moreover, we elevated that tragic experience into a noble crusade. Indeed, even today we have not permitted ourselves to reject or feel remorse for this shameful episode. Our literature, our films, our drama, our folklore all exalt it. Our children are still taught to respect the violence which reduced a red-skinned people of an earlier culture into a few fragmented groups herded into impoverished reservations. -Dr. Martin Luther King Jr. The Sioux tribe charged into battle to retake land that was rightfully theirs. Their attack was on Fort Rice, which is now part of the state that is today known as North Dakota. It was 1863. It was about 350 years after the war started. Arrows were flying and gunshots were being fired. On that same day a strong warrior named Sitting Bull was promoted to war chief after the bravery that he showed in battle that day. Sitting Bull was born into the Sioux Indian tribe in 1831 in South Dakota . Even at a very young age he always had someone to look up to. That someone was his father, Jumping Bull. Sitting Bull wanted to be just as great a warrior as his father. At the age of fourteen, he finally got to fight against another tribe of warriors to prove his worth. He fought bravely and was given his native name, Tatanka Iyotanka, which means a sitting bull. Later in his life he took part in multiple attacks on the US settlers. Later on, even more settlers came in. Eventually, Sitting Bull decided that his people should move out to the Plains to keep his tribe safe. He also let in any tribes that lost their homes due to the white settlers claiming their land. It was a home to many, and they had many resources such as medicine, food, and shelter. Sadly, even more white settlers came in due to the California Gold Rush. The Sioux replied with force and fought back for what was their land. Sitting Bull led many battles against the US Army such as the Battle of Rosebud and the Battle of Little Bighorn. In the Battle of Little Bighorn, the Indians outnumbered the US with two-thousand men. The US greatly underestimated the Natives. They were ashamed that they lost. They got so mad they attacked again, this time with even more troops. To save his people, Sitting Bull decided that’d be best for them to move to Canada so he wouldn’t have to risk losing more lives. He stayed there for four years with his tribe. It was a very dark time for the Sioux tribe. A lot of them starved to death due to the lack of animals that they were able to hunt. The rest of his life proceeded at a leisurely pace until he died. He continued to reject Christianity and continued to go about his people’s way of life. In 1889, Sitting Bull and other Indians decided to take up the Ghost Dance which is a ritual which resembled ridding the land of white people. People took offense to this and felt intimidated, so eventually the police showed up. They entered his home and tried to drag Sitting Bull out of his cabin. Sitting Bull resisted arrest, things got heated up, and a cop fired a shot. The fire fight ended with Sitting Bull dead from one shot in the chest and one shot in the head. Sitting Bull fought for what his people rightfully owned. They fought for their culture and their land. I respect that greatly, and therefore I will always look up to him for what he did.